PROCEEDINGS OF THE COMMISSIONER OF SCHOOL EDUCTION & EX- OFFICIO PROJECT DIRECTOR, RMSA, AP, HYDERABAD. Sub:- SE - RMSA - Release of funds for purchase of furniture and lab equipment in the sanctioned components under RMSA - Phase-II at School level in approved 162 Secondary Schools in the State - Orders - Issued - Reg. Read:- 1 This office Procs. Rc.No.1089/RMSA-AP/2014. dt.07.1O.2014. All the concerned Head Masters I Head Mistress / Principals of the approved (162) Secondary Schools for strengthening under RMSA Phase-Il ore informed that the Commissioner of School Education and Ex-Officio Project Director, RMSA-AP, Hyderobod is pleased to accord for sanction for an amount of Rs.2.15 lokhs to Rs.615 Lakhs towards purchase of furniture and Rs.1 .00 lakh towards purchase of lab equipment to the each of the 162 Secondary School SMDCs (as per the list enclosed) in the State under RMSA Phase-Il where construction of Additional class rooms have already been completed. In this connection the amounts are released to the tune Rs.978.10 Lakhs (Rupees Nine Crores Seventy Eight Lakhs onLy) to the SMDCS concerned. Procurement of Furniture is to be done by SMDC only. i. Estimate total number and cost of items identified based on the approximate unit cost. ii. The SMDC shall make a resolution for procurement of the furniture/ lab equipment regarding best way of procurement as per the FM&P Monual-RMSA. iii. SMDS shall procure the furniture and lab equipment in a transparent manner keeping in view of the specifications and guidelines. iv. Identify Registered Firms / Agencies from whom quotations can be invited minimum three or more to ensure competitive rates). v. After passing the resolution by SMDCS they must indicate in the order to the identified agency mentioning specifications, quantity and quality of goods. desired delivery, time and place the terms of the accepted offer including applicable taxes. duties and payment terms shall be incorporated in the purchase . The warranty period of the purchased furniture should be more than 36 months from the dote of supply of material. vi. Ensure timely supply of items by the identified agency. vii. Received and Account the supply received (Inventory) and making payments after delivery of goods in satisfactory condition. viii. Rote contracts of Directorate General of Supplies and Disposals (DGS&D) may also be used as a substitute for shopping. ix. All payments should be done by SMDC by way of transferring funds to the concerned agency through a crossed cheque only (RTGS). x. The APEWIDC has supplied the furniture based on the rates finalized by the State level committee through (1) MIS Godrej and Boyce Mfg. corn. Ltd. Secunderabad, (2) M/s Featherlite Office Systems (P) Ltd. Bangalore and (3) M/s Methodex Systems Ltd., to all the Model Schools in the State. The approved rates and specifications are suggested here under for reference. i. The overall dimensions should be of size 1200mm X 895mm X 750mm. The Desk panel (1200 X 330 X 18mm) with 10 degree inclination, Seat(1200X260X18mm) and Back (1200 X 260 X 18mm) should be made of 18mm thick Pre-Laminated Boards with PVC edge banding on all sides. The under structure should be made of 25.4mmX25.4mmX1.6mm thick powder coated Electro static welding resistance at base which should be welded to the desk and seat supports that are made of 1.0mm thick powder coated MS'C' sections. ii. Vertical frames at base and back of seat made of 25.4mmX25.4mmX 1.6mm thick powder coated ERW tubes should be provided as stiffeners between them. iii. The storage shelf 150mm. height height, closed on three sides should be made from 0.8mm thick powder coated MS sheet affixed below the desktop. Hooks made from 6.0mm dia MS rods should be provided on either side of the vertical frame of the desk, for hanging bags! bottles. a. The overall dimension should be 900mmx59Ommx74Omrn. The table top has to be made of 18mm thick. Pre-Laminated Board (PIB), of approved quality and shade. c. The stands for table should be made of tubular frame of MS ERW Square Tube of size 25.4mm, 1 .2mm thick. Overall dimensions 800mmx33Ommx55Omm. the seat and back shall be made of 1.2mm 18 BG thick MS. Perforated sheets with cushion . The steel should be durable one and chair with arms. i. The under structure should be provided with black PP injection moulded ferrules.Hard rubber bushes should be provided to rest chair on floor Epoxy polyester powder coating DFT (Dry Film Thickness) of 45 microns as per IS 101.
ii. MILD STEEL as raw material should be use, Cold rolled Close annealed steel use for thickness 0.6 to 1.2mm range as per iS- 5131994(reaffirmed in 1988) Grades “D” or DD” quality. iii. Chemical composition, tensile properties. bend test, surface, flatness, hardness as per IS-51 3 1994. The above items total cost of unit shall include cost of all materials, manufacture, transportation to site, assembling at site including loading, unloading and assembling charges at different floor levels of the building. including VAT and all other taxes etc., complete for finished item of work. These items shall carry a warranty period of 3 years (36 months) from the date of supply. SMDC can keep above specifications and rates in mind as guidance before finalization of procurement. They are at liberty to procure number of items from any agency without compromising quality and not exceeding the above prices. Further a list of items identified and recommended by the State Level committee for purchase of laboratory equipment in Model Schools which was scrutinized and finalized to the extent of Rs.1 .00 lakh by SCERT Andhra Pradesh for classes IX and X is also appended to this proceedings to procure as per norms of RMSA specified above. 3. District Educational Officer & Ex-Officio Project Co-Ordinator. RMSA. 4. Head Master / Head Mistress / Principal of the concerned Secondary School as convener. The Head Masters of concerned Secondary Schools are also informed that any deviation in procurement of the above materials will be viewed seriously and action will be initiated as per CCA rules. The Head Masters are further requested to submit a compliance report for utilization of funds released for this purpose to the District RMSA Office and State RMSA office. Click Here to Get Rc.No. 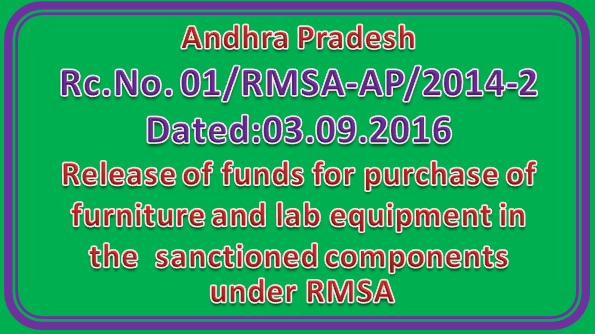 01/RMSA-AP/2014-2, Dated:03.09.2016.